This is the fifth purana review I’m writing, and is the second Rajasika Purana I am going to be writing about. Rajasika Puranas are Mahapuranas that glorify Brahma, instead of Lord Shiva or Lord Vishnu. 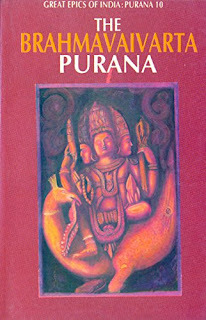 If you want to know more about the Puranas you can go to my first Purana review, of the Shiva Purana. This is a unique Purana as it is the only Purana that has referred to Krishna as ब्राह्मण (Brahman), the divine essence. We cannot describe the divine essence brahman, as it has no traits that can be described. It is said that it is from him other gods and goddesses. They have then described the process of creation that is pretty much the same. There are four parts to it. They are the Brahma khanda, the Prakriti khanda, the Ganesha khanda and the Sri-krishna-janma khanda. The only part that I found a little unusual is that they have mentioned that at the start that Saraswati and Lakshmi were married to Lord Narayana! I have usually heard that Ma Saraswati was married to Brahma. They have said that Brahma was married to Savitri. This Mahapurana is eighth in the list of the Puranas’, and consists of eighteen thousand shlokas. The first part of the Purana, the Brahma khanda talks about the creation of the gods, goddesses, men, etc. The Prakriti khanda talks about the different ways through which you can worship the gods and goddesses and their nature. It also describes the different kinds of hells, heavens, and the cures of different diseases. The Ganesha khanda, as the name suggests, is more about Lord Ganesha and some common stories associated with him. It also talks about the various hymns to him and his conversations with Sage Bhrigu. The last khanda, the Sri-krishna-janma khanda, is more on Lord Krishna’s birth and deeds. I liked the Ganesha khanda the most, because I have always loved stories that are related to Lord Ganesha. From the Ganesha khanda, my favorite stories are the ones about how Ganesha’s head was cut off, and how Ganesha came to be known as Ekadanta. Parvati wanted a child, so she performed the punyaka vrata, and Lord Krishna himself took birth as her child. When the child was born, many gifts were brought, and many people came to visit the child. Among those people was Shani (Saturn), the son of Surya. When he approached the child, he bent his head and did not look at the child. When Parvati questioned him on his strange behavior, Shani explained, “I have been cursed that whatever I directly look at will get destroyed immediately. I was cursed by Chitraratha, the daughter of the gandharva king, and my wife, as I neglected her.” Parvati took it lightly and laughed it off. She asked him to look at her. Tempted, Shani looked at the child, not Parvati from the corner of his eye. The damage was done. The next moment the child lay headless in Parvati’s lap. Parvati was shocked, and fainted. Krishna mounted Garuda and went northwards. He found a bull elephant sleeping. He sliced the head of the elephant, who was Airavata, and rejoined it with the child’s body. Parvati was happy, but she cursed Shani that he would be angahina, without a limb. That child was none other than Lord Ganesha. Parashurama was the son of Sage Jamadagni, and Jamadagni had been killed by Kartavirya Arjuna who was a kshatriya. Parashurama therefore vowed to get rid of all the kshatriyas in the world. As Shiva was Parashurama’s guru, after performing his vow, he decided to pay his respects to Shiva. He went to Shiva’s abode, Kailasha, but was stopped from entering it by a respectful Ganesha. He said that Lord Shiva was sleeping, and Parashurama ought to wait for a while. Parashurama tried making Ganesha see reason, but he later got angry when Ganesha refused. They started fighting, and Ganesha extended his trunk to a long length and hurled Parashurama onto Earth. Seeing his chance, Parashurama let the parashu loose. The parashu was a weapon given by Lord Shiva himself to him, so it could not be completely repulsed. It broke Ganesha’s left tusk. Since he has one (eka) tusk (danta), he came to be known as Ekadanta. I really enjoyed this Purana and these two stories. They are crisp and well written. I enjoyed every single word of it, and did not feel bored. These abridged translations of the Puranas help you know the basic information you should be knowing about the Purana and may help you understand the unabridged ones better. They are not very long, only a hundred pages long and can be completed in two hours or so if you read them without a break. I loved the short stories as they were interesting. Each Purana has different versions of the same story. When you read the story about Ganesha that I have mentioned above, you will find them very different from what you might have heard of the same tale. I have read five Purana’s so far, and each Purana has been more interesting than the other.